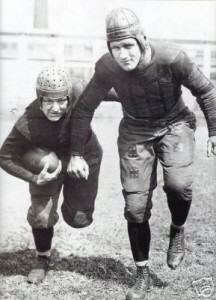 October 22: In 1933, Red Grange and Bronko Nagurski lead the Bears to a 13-7 victory over the Packers. In 1961, the Bears beat the vaunted 49ers shotgun offense 31-0. In 2016, Kyle Hendricks pitches 8 1⁄3 innings in the clinching game of the NLCS to send the Cubs to their first World Series since 1945. Aroldis Chapman gets Yasiel Puig to ground into a game-ending double play. In the game, the Cubs face the minimum amount of batters, 27, in a game. That’s the first time since Don Larson’s 1956 perfect game. Jon Lester and Javier Báez are named co-MVPs of the NLCS. October 25: In 1965, Leo Durocher is named Cubs manager, officially ending “College of Coaches” run…In 1977, the Cubs trade Jose Cardenal…In 1988, the Cubs announce plans for $14 million renovation of park, including construction of 67 mezzanine suites and a new press box…In 2016, the Cubs begin the World Series in Cleveland, making Dexter Fowler, Jason Heyward, Carl Edwards Jr., and Addison Russell the first African-American Cub players to ever play in the World Series. In 2016, In first World Series game at Wrigley since 1945, Cubs lose 1-0 on late run by the Indians. It was Josh Tomlin vs. Kyle Hendricks. Both pitchers pitched well, but in the top of the seventh, pinch-hitter Coco Crisp hit a broken bat single to score the games only run. In the ninth, the Cubs put runners on second and third following singles by Anthony Rizzo and Jason Heyward. Javy Báez struck out swinging to end the game. The win gave the Indians a 2–1 lead in the series. October 29, 2016: John Lackey hit hard and Cubs lose Game 4 of World Series 7-2. The Indians are only one win away from winning series. Corey Kluber pitches a gem on short rest, and also singles in the go-ahead run. The Cubs fall behind in the series three games to one. October 30, 2016: Jon Lester wins must-win Game 5 in World Series, sending the series back to Cleveland for Games 6 & 7. Lester is taken out with the 3–2 lead after six innings, and facing desperation, Cub manager Joe Maddon goes to closer Aroldis Chapman for an eight-out save. In the ninth, Chapman retires the side, striking out José Ramírez to end the game. It’s the first World Series win at Wrigley Field since 1945. The Cubs traded their six-time all-star and two-time gold glove shortstop Don Kessinger to the Cardinals for pitcher Mike Garman. That trade marked the official end of a Cubs era. Kessinger’s former teammates, the core of that 1969 team, had all left in the previous few years. Ernie Banks retired in 1971. Fergie Jenkins was traded to Texas after the 1973 season. Ron Santo was traded to the White Sox. Billy Williams was traded to the Oakland A’s. Glenn Beckert was traded to the Padres, and Randy Hundley was traded to the Twins. In return, the Cubs got Bill Madlock, Vic Harris, Steve Stone, Ken Frailing, Steve Swisher, Manny Trillo, Darold Knowles, Bob Locker, George Mitterwald, and Jerry Morales. Those players would form the core of the Cubs for the next few years.